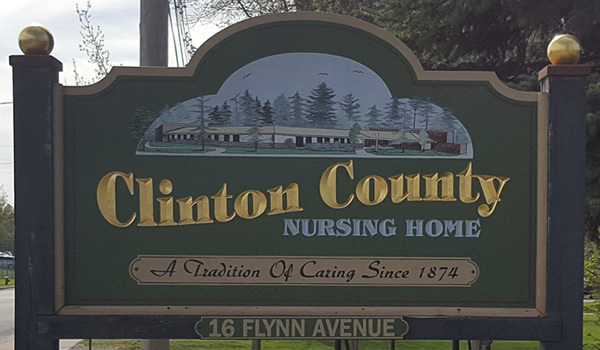 Clinton County Nursing Home is an 80 bed Medicare and Medicaid certified skilled nursing facility operated by Clinton County, centrally located on Flynn Avenue in Plattsburgh, NY. We have been providing quality long term health care and skilled nursing services to the community since 1874. We are committed to caring and excellence in the delivery of health care services to our eighty residents in a safe and home-like environment.. Whether your need is short-term restorative rehabilitation services or long term skilled nursing care, our staff of dedicated professionals is committed to the highest standards of quality care in all aspects of each resident's life at CCNH. Personal tours are available and we welcome and encourage potential residents, family members and friends to come and visit our facility. Please contact our friendly, professional admissions staff for more information. Our Admissions page will provide contact and application information. We will provide our residents quality, professional, medical and nursing services that enrich their lives. We will partner with the residents and families of Clinton County and surrounding communities, providing comprehensive care planning, rehabilitative, nutritional, therapeutic and social services in a homelike and caring environment. Our facility is licensed by the New York State Department of Health and approved for both Medicare and Medicaid. Call us at 518-563-0950 should you need any information, and we will be happy to help.